In 2016 I was awarded a work placement with London based Luthier Philip Ihle. I have always been a great admirer of Philip’s work and was very excited and privileged to be given the chance to spend time with him in his workshop. During my time with Philip I was given a Brescian plate to purfle. 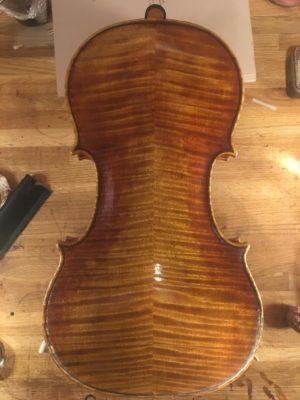 This was an exciting challenge as Philip explained the techniques he wanted me to apply to achieve the correct aesthetic for the Brescian style. In this way I had to work much faster than I would have usually worked as well as placing less care into the tidiness of the channel. Doing this with Philip allowed me the platform to attempt a new methods to achieve different results; using 3 different strips for the purfling as opposed to the purfling I usually use which I glue together beforehand. After purfling the plate I was also given the opportunity to arch a late period Strad model back with his guidance. Philip offered me a detailed insight into what to look for during arching as well as providing me a new technique I had not previously considered. I am very grateful towards Philip for allowing me into his workshop and sharing his knowledge and experience with me. It was an experience I will never forget and I learnt many skills and techniques that I still use today. In 2017 I was awarded funds to purchase the Peter Biddulph ‘Giuseppe Guarneri del Gesu’ books. However as it has become out of print I was instead able to put funds towards purchasing the ‘Antonio Stradivarius Vol. I-IV’ books by Jost Thöne. These books include detailed measurements, histories and 1:1 scaled photographs of 148 of Antonio Stradivarius instruments. With the support of the RAB trust I was able to afford these incredible books which helped me in preparing and studying for my final test at Newark School of Violin Making as well as my work beyond that. I want to thank the RAB trust again for their support and providing me the resources to afford this set of books which will no doubt remain be a indispensable resource throughout my career.